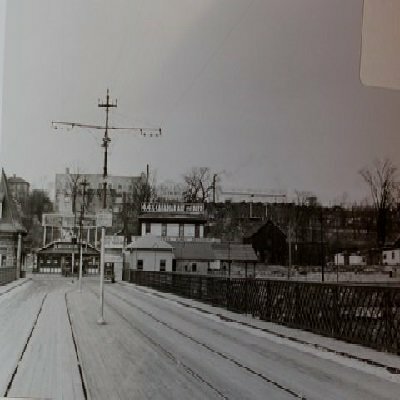 When you look at this photograph taken in the mid-20 of the Queen’s Hotel located on River Road at the Canadian end of the Honeymoon Bridge it’s interesting to know that this is the same building now relocated approximately 90 years later to St. Paul Avenue where it is now one of Niagara Falls most popular restaurants. Lots of advertising was found as you entered Canada from this bridge also known as the Upper Steel Arch Bridge (1898-1938). See the ad for the Great Gorge Route-Niagara Belt Line (July.1895-Sept. 1935) which was a train loop that one time operated on both the Canadian and U.S. side of the border. See the ad also promoting the higher alcohol content for Canadian beer and ale. The Oneida Silversmith Plant is seen above the bank in the distance. Today it is the location of Niagara Falls original casino. This bridge was destroyed by the build-up of a sever ice-bridge on January 27, 1938. This bridge was re-placed a few years later by the Rainbow Bridge which still exists today.